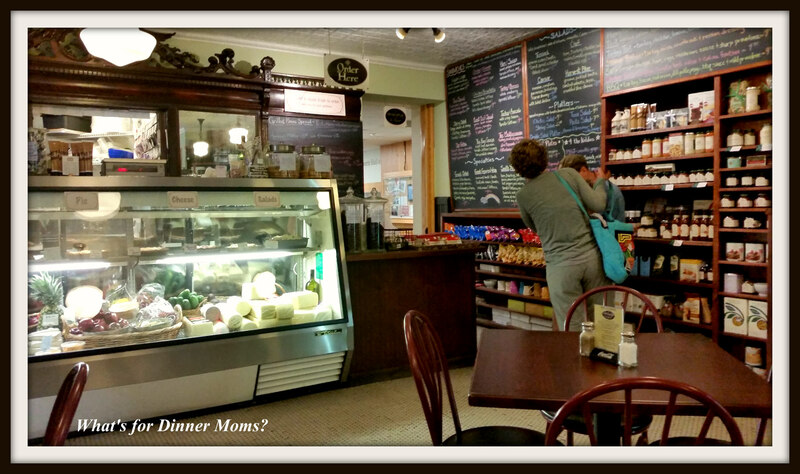 On the Road Again, Part VI (The End) – What's for Dinner Moms? Our last day started out in Corning, New York. We decided to have lunch at the Old World Cafe & Ice Cream and then visit the Corning Museum of Glass before starting the drive home. The cafe was so cute! 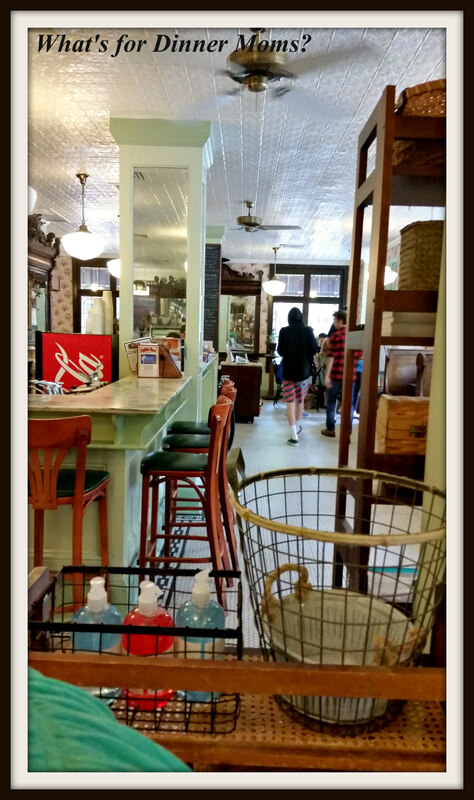 It definitely had the old-time feel with the items that were for sale and the sandwiches, soups and salads that were available. 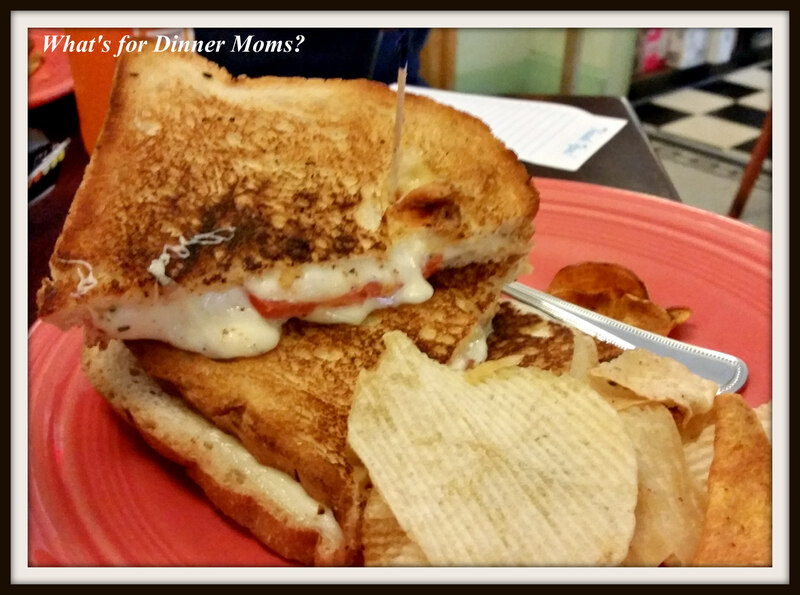 We all chose a different panini to try and we were not disappointed. The sandwiches were HUGE! There are actually pieces of the sandwich on the plate. They were each delicious though my kids thought the crusts were a little bit too thick and needed more filling around the edges to distract from them. The only choices of bread are white or rye so that was a bit disappointing but we would gladly go back again to try some of their other items. After your lunch you could visit the ice cream parlor but we were far too full. 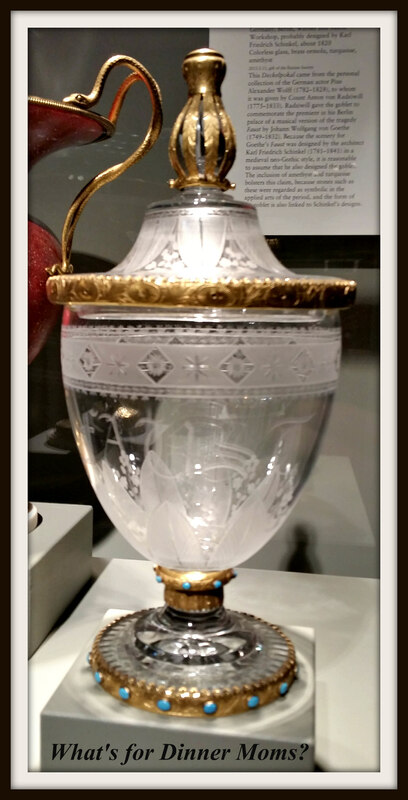 So we headed out to the Corning Museum of Glass. Though we only lived about an hour away we never visited the museum in the 20 years we lived in Rochester, New York. Despite it being a week day the museum was busy with many tour groups and families. This Chihuly was right near the check in desk of the museum. 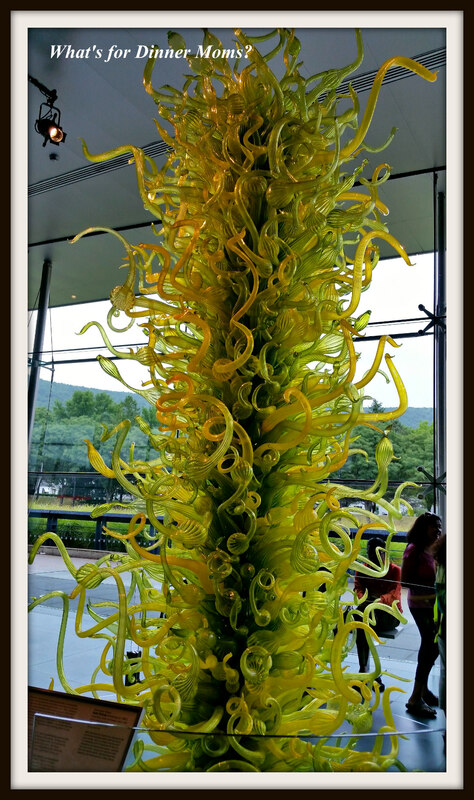 Chihuly is one of the artists that children in this area learn about at a young age as there is a Chihuly sculpture at our local art museum. Both kids recognized the piece as soon as they saw it. We purchased our tickets online prior to arriving so we only needed to pick up our tickets. 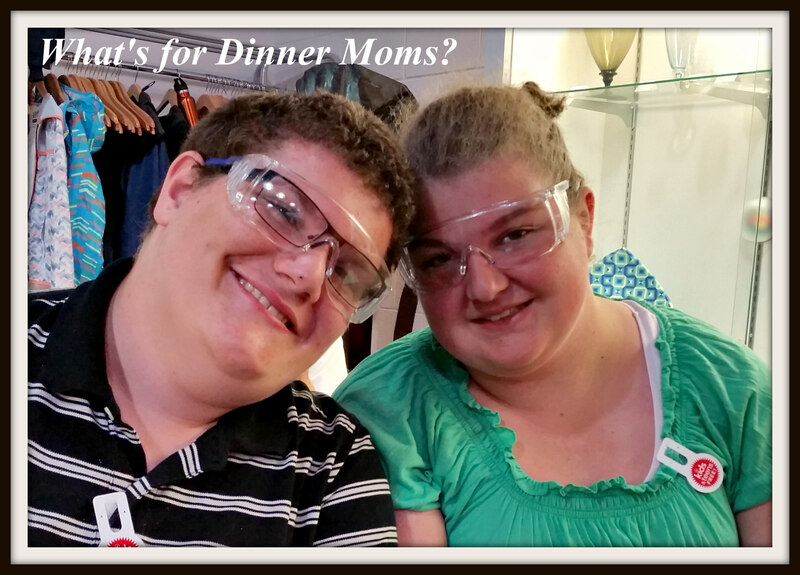 I HIGHLY suggest if you or your children want to do one of the glass making experiences to make your reservations on-line ahead of time. They go quickly and we were shut out of one time while I was trying to enter the credit card information. 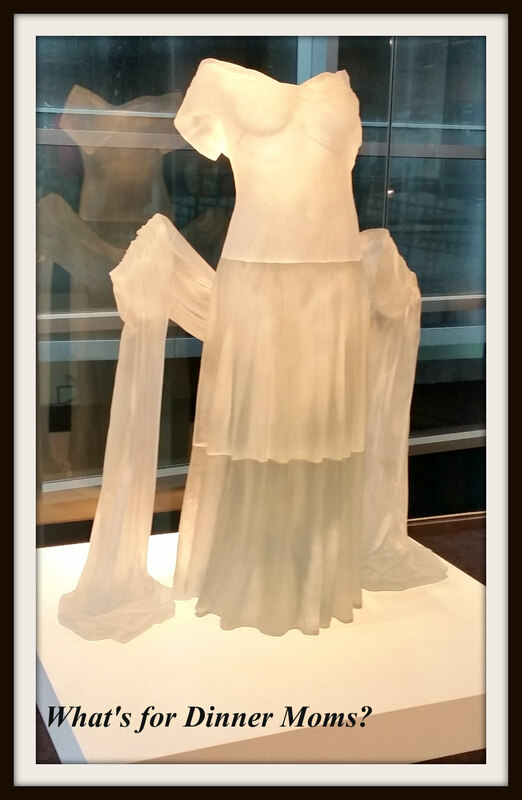 Yes, that is a dress and shawl made of glass. The pieces were such a wide variety from antique artifacts to contemporary avant-garde that there is something that everyone will like or at least think is interesting to look at. Sorry the pictures aren’t great but you can get the idea of some of what they have. 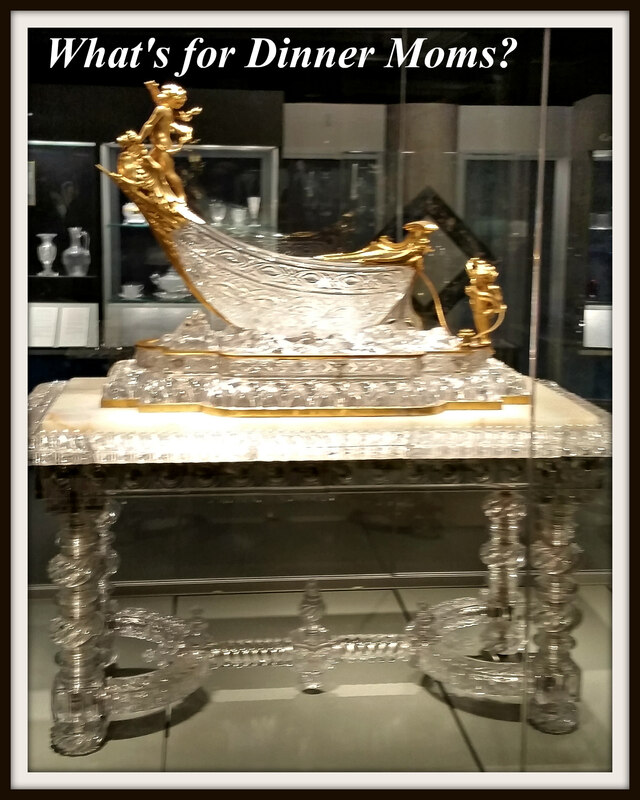 I was fascinated by this large glass and marble table. I couldn’t imagine having a home to want to put it in. All I could think of was my kids falling into it or banging something on it and it shattering. The details of each and every piece was amazing. I could have easily spent two days reading all the information on each piece and touring the museum. But, we only had a few hours. 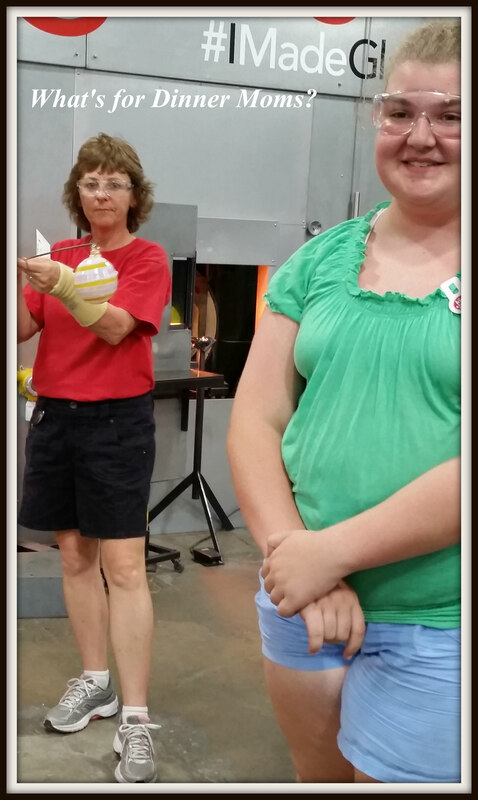 One of the things we all agreed on was that the glass blowing demonstration is a must do item if you visit the museum. You get to create a glass item for an additional fee to have shipped to you – $19 for the items or you can pick it up the next day. Because we were leaving town right after the museum we had the Christmas tree ornaments the kids made shipped to us. The kids could choose the colors, shape and if they wanted swirls, smooth glass or ridges on it. The ornaments were much heavier than I thought they would be, they were delivered yesterday. They look so fragile but are fairly heavy. Safety goggles on and waiting their turn to blow the glass. Finished ornaments. Very, very, very hot. Had to sit overnight so we could have them shipped to us. This one is purple, green and white once the glass cools. This one is actually a dark green glass with blue and white flecks in it. It has ridges. It is gorgeous. My son said it looks like the planet from space. 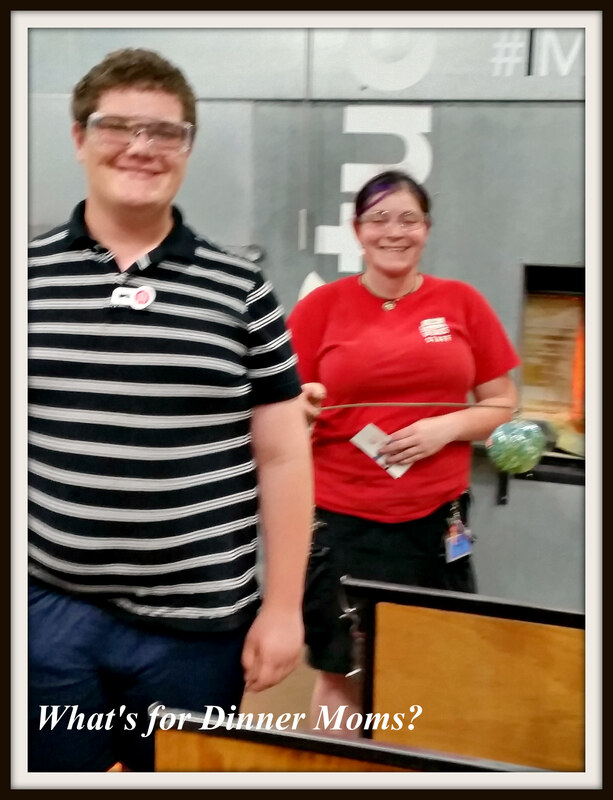 Both kids were really happy they got to try blowing glass to see what it feels like. Both have said they want to try one of the more interactive ones like the flowers next time. I am so happy we did this experience because now they have a forever keepsake. We headed home about 5 pm. We had to make it to Toledo, Ohio before we stopped. It was tough but we have fun in the car. We recast the musical “Hamilton” with the cast from Big Bang Theory and then the Muppets. We also play song games. Pick a word or theme and the kids had to take turns singing songs with the word or theme in it. First one to 10 songs wins. This helped pass the time for about an hour. We love traveling together but after 7 states, 6 cities, 2,282 miles, and 4 large-sized adults in a hotel room each night we were happy to have our own beds. Part of me didn’t want it to end because I love having us all together and I know it will not be too much longer before they are doing their own vacations with their friends and family. But, for now we will continue to make memories. So interesting and a wonderful vacation! Love the photos! Thank you so very much, Lynn! Hope you are having a super summer! Fingers crossed for Spring break. Woo hoo, vacays are always fun but yes, your own bed feels SO GOOD after being gone! 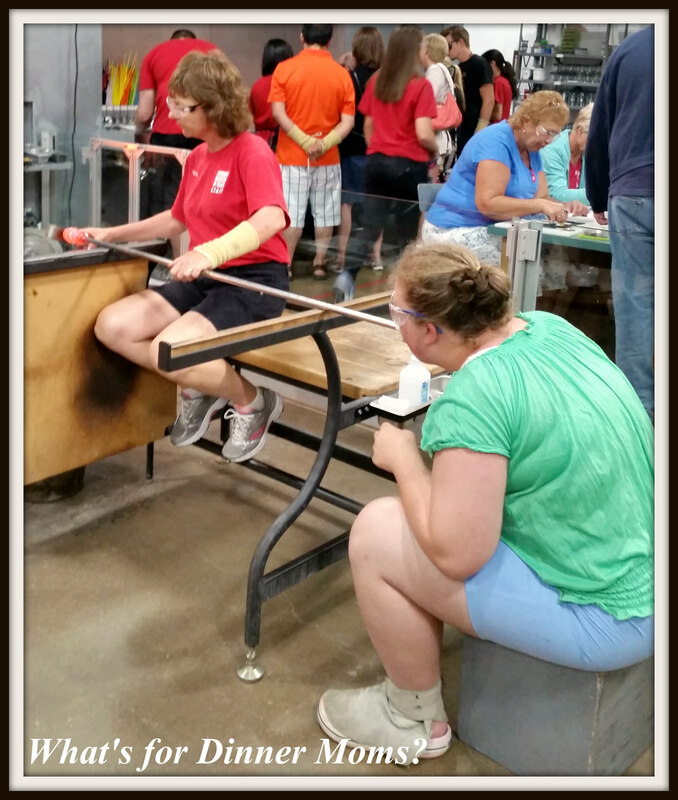 The glass-blowing class is one I am sure they will remember for years to come. I hope so. I am very much into creating memories with them right now. I hope they love them in the future as much as I do now. Love this! Okay, I’m heading to Corning, NY for a vacation next month. Love the glass making idea. The people were so nice. Definitely doing the flower next time as it is more interactive with more shaping and tools.